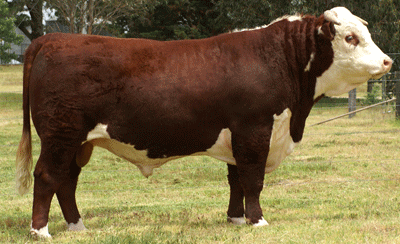 Peter Faithfull, Omeo, purchased Victory for $10,000 at our 2010 Sale. We were keen to follow this sire’s progress and, on inspection, his daughters were an even and impressive line. One of the best lines of heifers you could wish to see. Victory’s sons were equally exciting and have consistently featured, during recent years, in the top selling pens of calves the Faithfull family have offered at the renowned Mountain Calf Sales, Omeo. we were confident that this easy doing Trail Blazer son, with his proven commercial acceptability and his exceptional daughters, had a role to play in our program. His first three Mawarra sons are true to type and sold at our 2016 sale to $14,000 recording an average of $9,700.